Learn what opening balances are, how to figure out where the money came from, and how to enter your opening balances into Kashoo. The article below discusses how to enter an opening balance by using the adjustments (journal entry) window. If you are looking to import a trial balance from a spreadsheet, please see our article Importing a Trial Balance. When you first create a business file with Kashoo, you may have bank account balances, outstanding receivables, assets, and prior income you’d like to show on your Balance Sheet and Statement of Profit & Loss. To do so, you must enter a summary of your past business activities. This can take many steps, and may require some knowledge of bookkeeping terminology, like debits and credits, equity, and retained earnings; if you’re not sure if your ability to do this yourself then we suggest hiring a bookkeeper to assist you. Key Question: Where did the money come from? In addition, there may be other assets and liabilities to put on the Balance Sheet besides your bank accounts, which also have to be “accounted for” – that is, you have to show how you bought them. Any equipment, furniture, or land that your business owns that has re-sale value has to be recorded as an asset. Each asset value (a debit amount) has to be “paid for” with a matching credit amount (past income or investments). The steps below take all this into consideration for a typical business (you may want to consult with an accountant anyway, just to be sure that we didn’t skip something relevant to your particular business). It looks like a lot of work, and it may be! However, it only has to be done once, and this information has to be gathered and entered regardless of which business accounting software you use. 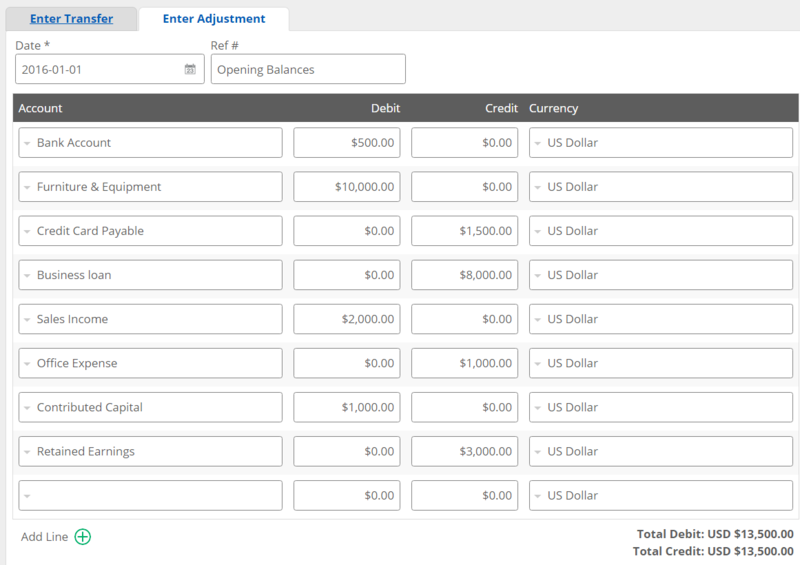 However, for many solo consulting/freelance businesses, the entire operation boils down to taking their bank balances, subtracting their credit card balances, and reporting the remainder as “Retained Earnings” as shown in the example screenshot. Ideally, they would also include their laptop and desk as an asset value (minus any past years’ depreciation if they didn’t buy them this year). Subtract total debits from total credits to get your retained earnings. If this is a negative number, enter the amount in the credit column as “Retained Earnings”; if it is positive enter in the debit column. Click Add to enter the adjustment and update your account balances. When entering outstanding invoices and bills, be sure to enter the correct dates so that the income or expense is reported in the correct fiscal period; at the very least, report past years’ income on the last day of the previous fiscal year.